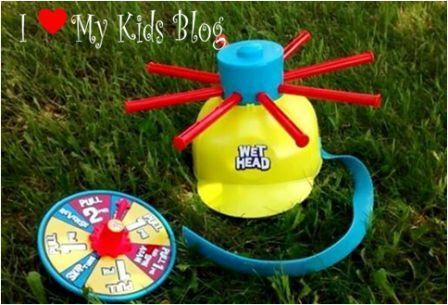 Cool Off This Summer With a Game Of Wet Head! 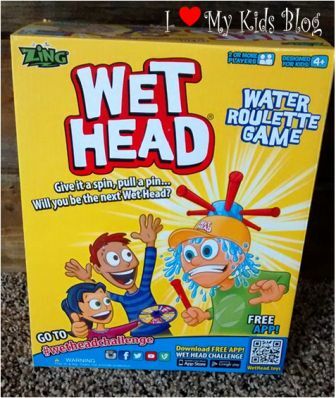 Have you heard of the game Wet Head yet? If not, then you are in for a treat! 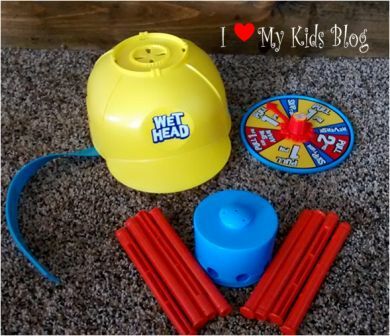 Wet Head is a fun new water roulette game that has become a new family favorite at our house! It was easy to assemble, (in fact my 9 year old did it) the assembly instructions were printed on one flap of the box. After about 10 seconds we were ready to play. Insert the red pins into the cap. They act as a “plug” for the cap. You must have those in before you fill up the blue portion with water. Fill it up and strap it on your head. Use the spinner to see what your task is. Complete your task and if the water doesn’t come pouring down on you, you pass the hat to the next player. The game continues on until someone becomes the Wet Head! You can play it alternate ways as well. You can choose one person to keep the cap on at all times and friends or family can be the spinner and pin pullers. No matter which way you play it, it is SUPER FUN! There is also a Wet Head challenge you can take online so check it out! It is so much fun. It’s a game of chance and if you use really cold water from the hose it makes it even more exciting! I think this would be a great game to take to a family reunion. I can’t wait to share it with our friends and family. We recorded the first time we played and it was so fun! We chose to wear our swim suits while playing, but it could be done in regular clothes as well. Enjoy the video! This game is on sale on Amazon for just $11.99 right now! I’d definitely reccomed picking it up for a fun filled summer time activity! What a great price! Disclaimer: I received the item mentioned above so I could form an opinion to share with you! Regardless of our arrangement I was not required to share a positive review. I was encouraged to leave an honest review and we honestly LOVE this game! One affiliate link is in this post for Amazon. Oh my gosh! We love this game so much! My 8 year old son played this with his 10 and 14 year old cousins. They ALL loved it. Finally a game they can all play together!